In my recent post on the EPL Draw, I mentioned the troubling trend whereby Pinnacle's over-round this season has crept up from last season's 102.11% (itself up from 2016-17's 102.05%) to 102.24%. We're still early in the season, but a closer look reveals that the larger over-rounds are in matches where there is a Big 6 team playing a Little 14 team. Of the 17 matches where the over-round is 102.5% or greater, 16 fit this description. 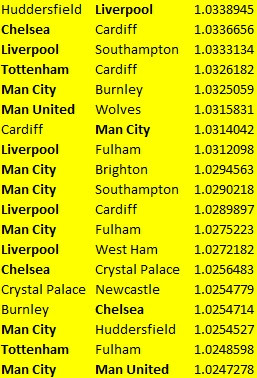 The one exception is Crystal Palace v Newcastle United and there's a legitimate argument for including Palace in any list of 'Big' teams. Two FA Cup Finals since 1990, a Zenith Data Systems Cup win in 1991, back-to-back FA Youth Cup wins in the 1970s, first ever winners of Division Three in 1921... the list goes on. Conversely, where the over-round is less than 102%, 23 of the 28 games are all Little 14 matches. It seems likely that when a 'Big' team (or Crystal Palace) are playing, Pinnacle know there will be a lot of interest and push the over-round up, while for the matches between 'smaller' teams such as below (no sign of Palace here, which rather backs up my theory about them), the odds on offer are a little more generous. It makes perfect sense from a business perspective, but it's something to be aware of as the season resumes next week.